Shu-wei Lin – a gifted student who enjoys being a tattletale – has long been bullied by all of his classmates; the notorious trio of the class makes fun of him on a daily basis. By chance, the class teacher assigns the four of them to community service. The boys sure have every intention to make the most fun out of their duty. One night, the four of them decide to steal a safe from a demented elderly loner and unexpectedly capture a cannibalistic humanoid during their heist. The four employ a variety of odd methods to investigate the little creature after school at their secret base in hopes of understanding it. Despite Lin’s disapproval of the trio’s attempt of studying the creature, the creature has allowed him to bond with the trio and grant him a sense of acceptance. Meanwhile, the little creature’s monster companion has been frantically searching for it since being separated. As the monster approaches, their minds become twisted and their friendship is eventually put to the test as they confront the monster. In the end, it doesn’t matter who’s the bully or who’s bullied: everyone turns into a monster that can’t go back. Tiffany Yong: After watching the movie “The Tenants Downstairs” written by Giddens Ko, I don’t think there could be anything else that shocked me more. As his works got darker, it wasn’t easy for both of us not to wonder what he had went through to create such realistic yet inhumane horror. Nope, I don’t mean horror in the scary-ghost-horror-sense, I meant horrifying-news-report-of-psychotic-killer-on-rampage-sense. And all I was expecting initially was a thai-horror-comedy-resque set in the typical haunted high-school. But it really surprised me by being a lot more than that. I could just be over-thinking it and it was just that, but humor me while I contemplate the possible ideas that are being shared in this film. Peps Goh: Midway through the character establishment in the first act, it quickly became apparent that Giddens Ko wasn’t merely going to make this a typical Rings-wannabe with a particularly gory sense of dark humor. The writing is really thought provoking, and it is almost an allegory against bullying. More than that, it was a social commentary upon the various ugly ways that our species behave when presented with a chance to exert power over another being. And our ugly tendencies to; turn the other cheek, take no action, shift responsibility, take enjoyment in other’s pain, dehumanise our victims to ease our guilt and demonise those whom are different to justify our behaviour. Tiffany Yong: I’m quite surprised by how Giddens Ko went all out to cover the various aspects of bullying instead of focusing on one particular area. Besides the most common physical bullying, he covered verbal bullying, cyber bullying as well as social bullying. It expands from the social circle within a school, to that of the neighbourhood, on the elderly, the mentally challenged and even to… well, ‘Monsters’. While some people might find some of the behaviour atrocious, I got to admit that they were uncomfortably true. By laughing, you are joining in. By not stopping them, you are guilty. “Mon Mon Mon Monsters” takes on the pessimistic worldview of how in the end, EVERYONE is guilty. Either by virtue of action, speech or of inaction. And with this assumption lacquered thickly upon the story-telling, it succeeded in being a powerful emotion stirring feel-bad flick, and I by no means meant this statement in a negative way. Peps Goh: Another part that struck a chord with me was with the religious teacher (Carolyn Chen). To me she represented all the people I had met whom claimed to be devotees and practised their religions with a fervent rigor. (Yes, we definitely know quite a few around us right now!) But whom actions failed to reflect the teachings that they preached. And they whom watched, eyes wide opened but minds closed off, as people suffered around them by proxy of their inaction, while they jacked-off to their self-indulgent delusion that they are good people. Peps once said how one can be so right that they are wrong. Carolyn Chen succeeded in portraying a character, Miss Li who does exactly that. She could turn a blind eye to the evidences shown to her and convinced the victim to make peace with the bully with such seemingly-logical reasons that I was dumbfounded. Yet when the bully overstepped the boundary by ‘insulting’ her religion, she went into a berserk, inflicting not just physical but also verbal abuse to the student. Tiffany Yong: Liang Ru-xuan’s portrayal as Ren Hao’s cold-blooded girlfriend reminded me of a crime that took place in Singapore 17 years ago when 5 teenagers held a 14 year old girl captive for 17 days and tortured her. One of the teenager’s girlfriend (She wasn’t named because two of her three sisters accused of being involved in the assault are juveniles) was also involved with the assault, scalding the victim and forcing her to do indecent acts. Liang Ru-xuan did not have many lines, but her indifference to cruel acts, enjoyment in watching other people’s discomfort was so realistic that I couldn’t help but root for the monster (Eugenie Liu) when both of them finally meet. I loved that the film was indulgent enough to let us watch these unlikable characters get torn to pieces or burnt to crisps. And my enjoyment in those scene may perhaps, indeed be a testament to the truth the film reflected. Peps Goh: I really took to the portion in the end of the film when it took on a red tint. I related strongly to the moment, and it felt like there was no other way that could have visually conveyed that moment. The emotional state of one who had just survived and witnessed a violent crime up close and too personal, and the loss of innocence that follows that deep trauma that colored the world an unpleasant shade, and every mundane thing we had laid eyes on before had suddenly looked so different. That visual representation was super on point to me personally. Tiffany Yong: While some might find certain portions under-developed, I felt that the nihilistic movie was meant to pose more food-for-thoughts than to provide solutions to the social problem. Perhaps it’s really time to wonder if anyone is actually inculpable of bullying, even if you’ve never actually act on it. Mon Mon Mon Monster is not based on a novel previously written by Giddens Ko. Inspired by Mikael Hafstrom’s Evil, he wrote and direct the movie and demonstrated most of the bullying scene himself. Carolyn Chen (陈珮骐) is a Taiwanese TV actress who does mainly local TV dramas. For this show, Giddens Ko persuaded her to give up 1 year of drama-acting, simply by saying how he thought only about her when he wrote the script. Jimmy Hung, song of Sammo Hung, was the action choreographer of the movie. 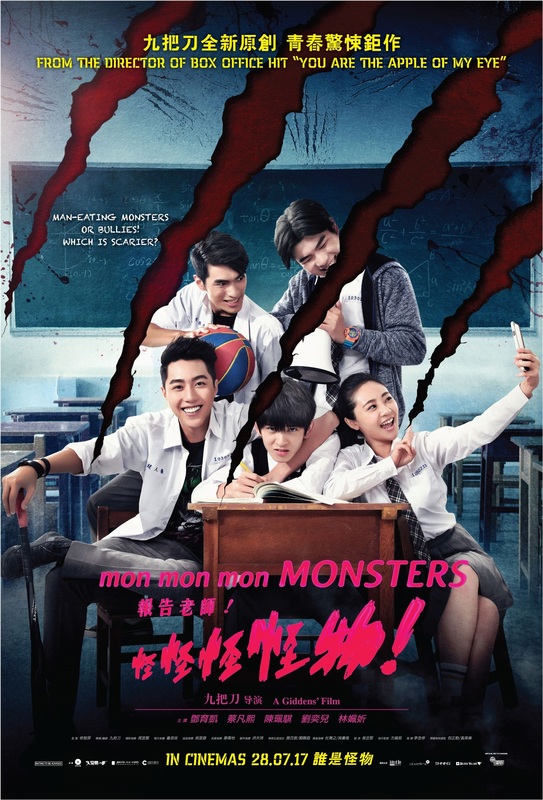 Check out MON MON MON MONSTERS (报告老师! 怪怪怪怪物!) Facebook Page! MON MON MON MONSTERS (报告老师! 怪怪怪怪物!) is out in cinemas on 28th July 2017. Love the review!! This looks like a really cool movie to watch. I’ll check will check this out. Is the movie in english?? Looks like something I’d enjoy! Wow! This looks like a really cool movie to watch. Hopefully it’s on Netflix soon. This movie sounds pretty scary! At least it shares great thoughts about non bullying which is cool! Hey Tiffany, is the movie in English or foreign language? I usually love foregin movies and from your thoughts on this I would love to check it out. Love the review! I actually love scary movies! I’ll def check this out when I have time! Love the tidbit about behind the scenes choreography! So interesting! This sounds like a movie with a lot of plot twists. Also sounds like a great coming of age movie about friendship and acceptance. Omg this looks scary! I love films like this, because they’re so different from what we’re used to. WOW! This looks like a great movie with lots of layers! Those are always the best!